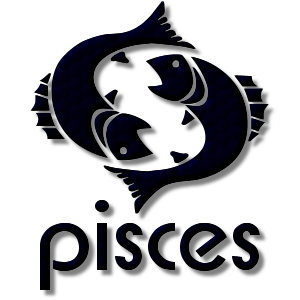 Add a Pisces The Fish Zodiac stampette to your Facebook and Twitter profile images and show your star sign. In Greek mythology Pisces represents the fish which Aphrodite and her son Eros transformed in to on the banks of the River Euphrates in order to escape the fiery god Typhon. They are tied together with a cord to their tails, ensuring they cannot lose each other. The twin fishes were placed in the Zodiac in honor of the heroic deed of saving Aphrodite and Eros from Typhon.